Did you know slow and awkward chord changes are the main reason most people give up on their dream of playing guitar? Well, instead of keep on struggling and eventually hating the guitar, get it sorted today. Learning guitar is hard enough without making it harder. 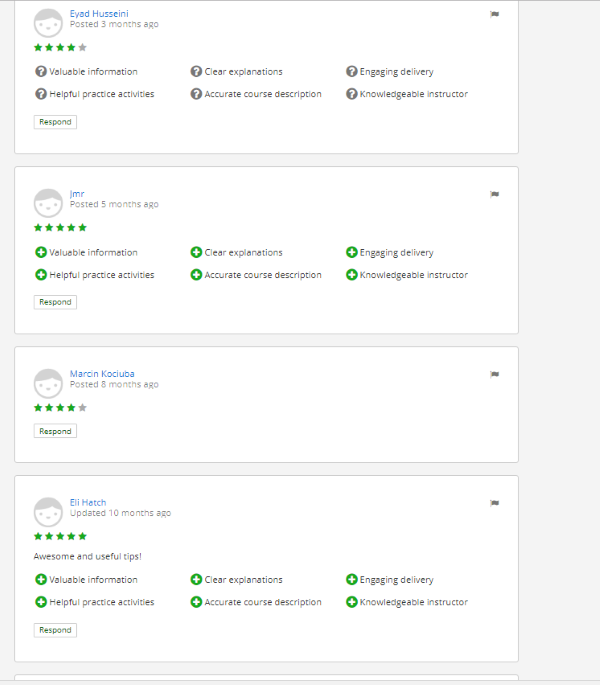 If you want the solution that will allow you more time to actually enjoy playing and learning the songs you love, check out this 5 star rated course…. Does it frustrate you trying to change from C to G? Do you often think “Why can`t I still change between chords quickly even though I have played and practised hard for months”? We have all been there. Trying to get good at changing between chords can feel like banging your head against a brick wall and is the primary reason most guitarists give up the guitar and let it gather dust in the attic along with their guitar playing dreams. The truth according to research is that over 92% of guitarists give up the guitar within the first 6 months of playing, and a large number of those cite “slow chord changes” or “stopping between chords” as the main reason for giving up. There are 7 very common mistakes nearly every beginner guitarists makes with chord changes. If you make just 1 or 2 of these mistakes you can get away with it, but it will probably hamper the speed of your chord changes. If you make more than a couple of these mistakes you will really be fighting an uphill battle with your guitar. The aim is to get the guitar to work with us, and not against us. If you want to improve your chord changes for the rest of your guitar playing days, then you must avoid these 7 deadly sins of chord changes. After teaching over 120 different students I have come to realise that there are two super powerful pro secrets that once learnt will rapidly speed up your chord changes. It`s funny really, in time you may work these methods out for yourself (if you are determined enough to keep playing and get past this stage) but now you can learn them today, and save yourself plenty of trial and error. You will need to know how to play some basic open chords and have access to a guitar capo. Over 12 lectures and 1.5 hours of content including a supplementary Ninja Chord Changes guide. This is your written companion to go along with the videos if you like to read as well as learn via video. Guitarists who struggle to make basic, fluent chord changes with the open chords. This course is not for experienced guitarists looking to improve their barre chords. The course is for anyone including ALL beginner electric and acoustic guitarists – I define a beginner guitarist as someone who has played for less than 1 year – who struggle with chords changes no matter how long you have been playing. Learn through our videos, eBook and audio supplementary guides the powerful steps to help you master the `dark arts` of changing chords. In less than 30 days if you follow the course and apply the knowledge on a regular basis you will notice effective, powerful improvements. Your chord changes and fingers will feel faster and you will be more relaxed allowing you to truly feel free with the guitar for the first time. You will finally be able to play songs without those annoying little stops between chord changes. Impress your friends with your fluency and new found guitar skills. `How To Practice Your Chord Changes For Maximum Success`. Do you ever find with the guitar that you have loads to work on and practice, but have no idea how to spend that valuable practice time? Well, chord changes need practice, and proper practice. Here is your unique and all powerful guide on how to perfect them in the shortest time possible while having the reassurance that the time you are putting in is spent well! The fastest way to get your fingers to move from one chord to another is by what I call the `Pivoting` method. There are 10 very common chord changes that many guitarists really struggle to play quickly. This causes daily frustration which doesn`t really get better for months until (usually) most students eventually stumble across the `pivot` method. Don`t wait months. Learn it and apply it today. You will make these 10 chord changes 1000`s per year in most case – they are that common. Using this method will allow you play a song without the dreaded pause which as I`m sure you have found kills momentum and creates masses of frustration for most beginners. You can know you can save lots of time, energy and frustration leaving certain fingers on the fretboard at all times, mastering the art of pivoting. Go forth and conquer the `pivot` method and have fun writing and learning lots of songs. You will learn songs quicker, sound better and impress yourself and others more when you learn about the art of `pivoting`. You will also be able to stop worrying about the chord change and free yourself up to think about other aspects of your guitar playing, such as playing and singing or strumming, or just free yourself up to enjoy your guitar playing more. Get yourself a free bonus eBook available in PDF formats so you can learn all about the techniques in this course in written format. This is useful for all you who love to read and travel a lot. On the train, plane or bus? 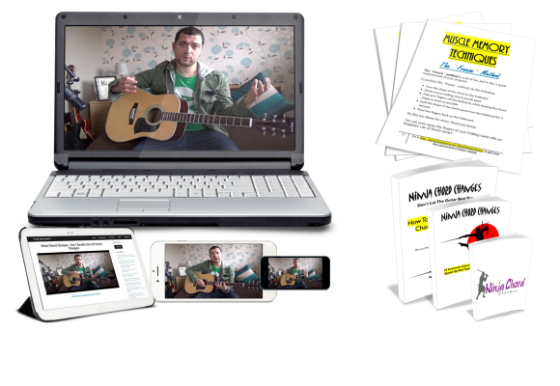 Grab your phone, laptop or Kindle and read through all of the techniques so when you are back to your guitar, you will know exactly what to do and will save time when going through and applying the video lessons. You will find the essential techniques of pivoting, `capo for chords`, the spider, the mirror, the importance of the 3 p`s, the blast method, and much more explained in even more detail ensuring you will have zero problems understanding and applying the powerful techniques needed to change chords like a ninja. “I’ve been playing the guitar for many years now – mostly self-taught. I wish I had this course in the beginning. If I had, I would have made quicker progress than I made on my own. Even with the experience I do have, there are lessons in this course and steps in the free bonus guide that helped me learn to play my chords better and faster. They even help me “correct” some bad habits I picked up along the way. The lessons on finger stretching exercises, practice tips, practice exercises, strumming tips, strumming patterns, and tips on improving my rhythm skills helped me the most. Good instructor, valuable advice, best guitar course i’ve seen! Really pleased Taught me a lot of tips and tricks Really recommend to all. “I have struggled with chord changes for years and lacked fluency in most of what I was able to play. I got so used to hearing those “pauses” and felt I just wasn’t fast enough. 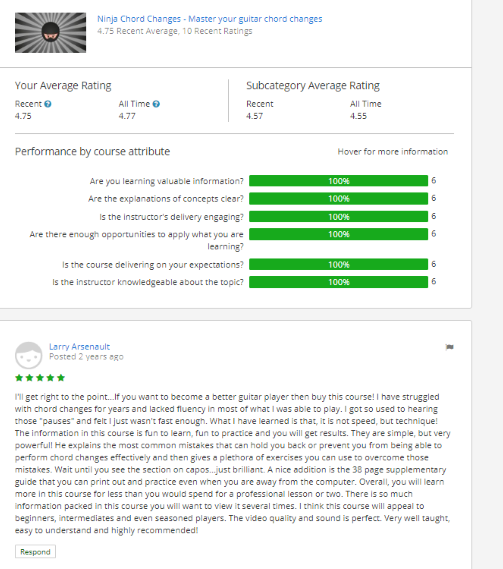 Larry Arsenault – “Excellent instruction! Ninja Chord Changes will absolutely, 100% positively change your guitar playing and if it doesn’t you have 90 days to get an instant, no questions asked refund. 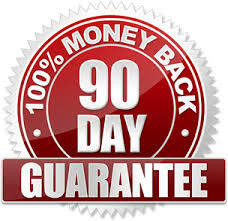 You will get a 100 percent money-back guarantee if you don’t feel this product has improved your whole guitar playing and helped you on the road to mastering this area of the guitar. You will even get to keep the bonuses. Take action now. Every moment you delay enrolling is valuable time and lot`s of joy with the guitar lost – enrol today.